Below are images from Ontario and Alberta during the 2016 Canadian amateur sports car racing season. In Ontario, competitors raced at Canadian Tire Motorsport Park, Calabogie Motorsports Park and a special non-points event at Shannonville organized by the Canadian Touring Car series. There were a number of classes scoring points towards Ontario Regional Championships - Formula 1600, Formula 1200, Formula Libre, Formula Four, GT1, GT2, GT3, GT4, GT5 (Sprints & Challenge), Vintage, Classic and Radical. There were four race weekends in Alberta organized by the Northern Alberta Sports Car Club (NASCC). Alberta is part of the Western Canada Motorsport Association (WCMA) which also includes Manitoba, Northwest Territories, Yukon Territory and Saskatchewan. All Alberta events were held at Castrol Raceway in Edmonton. 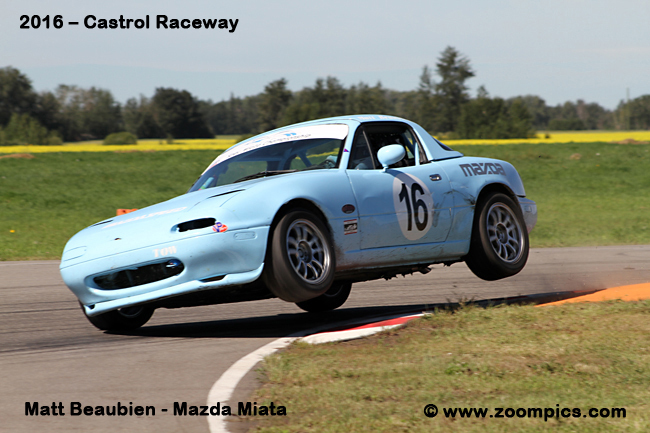 Drivers in Alberta were competing for titles in the following classes: Spec Miata, Formula Continental, Formula Libre, Improved Touring � J, Performance Tuning B, C, D, & E, Sports Racing, Super Touring 1, 2, & 3, Super Unlimited and Challenge Car.